Once in a while comes along a movie in which the setting is so captivating it becomes a character in its own right. For me, this list includes movies such as Howard’s End, The Holiday, You’ve Got Mail, Something’s Gotta Give, Baby Boom, The Grand Budapest Hotel, and ... here’s the odd one that stands out from the list … Only Lovers Left Alive, cleverly written and stylishly directed by Jim Jarmusch. A production still from Only Lovers Left Alive featuring Tilda Swinton (as Eve) and Tom Hiddleston (as Adam). Among a company of beautiful movie houses and settings, the 135-year-old mansion in Only Lovers Left Alive reigns in a league of its own. Clearly once a great beauty, the house Jarmusch features in the movie is more like an abandoned ruin than the elegant Gilded Age property it used to be. The mansion stars as the cluttered abode of Adam, a centuries-old, moody rock-star vampire who's finding himself bored and annoyed by the human race (whom he calls "zombies"). Located in the crumbling yet distinctive Brush Park neighborhood of Detroit, Michigan, Adam’s house in real life is a 6,200-square-foot Queen Anne house with the address of 82 Alfred Street, formerly known as the Whitney Mansion. An architectural rendering of 82 Alfred Street (formerly 36 Alfred Street) by artist Eric Becker. The artist is a friend of Jeff Cowin, the current owner of the Queen Anne mansion. Image via Airbnb.com. The history of 82 Alfred Street reflects the economic roller coaster ride that has carried Detroit for decades. Built in 1879 by James P. Donaldson (original owner), the house stayed in the Donaldson family for many years until David C. Whitney bought it in 1893. Whitney had architect Gordon W. Lloyd expand and remodel the house to its Queen Anne style. Over the years, there have been many other owners. And as Detroit changed, so did 82 Alfred Street. To accommodate the influx of auto industry workers pouring into Detroit in the 1920s, the house’s then-owner Jeanette Davies turned it into a boarding house. It remained as a rooming house until the 1940s. — Jim Jarmusch, Director of Only Lovers Left Alive, on filming in Detroit, Michigan. By the time Jarmusch and his film crew found 82 Alfred Street in June 2012, the house and its Brush Park neighborhood already reflected the wear and tear of the city's economic struggles. Only a few inhabited homes survived with shredded remnants of their gloried past. Among many of the houses in the area, the former Whitney Mansion (which came fully stocked with years of unwanted furnishings) won the director’s approval as the film location for Adam’s hideaway. The house - as it was when Jarmusch found it - perfectly symbolized the decaying beauty of a once-magnificent city. Screenshot from the movie of Adam's house. 82 Alfred Street where Only Lovers Left Alive was filmed - image via Pinterest. Chris-Teena Constas, Detroit location manager for Only Lovers Left Alive, said she scouted many locations for the movie before Jarmusch chose the house at 82 Alfred Street. "One of the main and most important locations was Adam's house," said Constas. "They really wanted to stay true and authentic to Detroit and the architecture." — Chris-Teena Constas, Detroit Location Manager for Only Lovers Left Alive. Screenshot from the movie of Eve's arrival at Adam's house - the setting is Adam's living foyer and living room. The foyer and living room area of 82 Alfred Street, where Only Lovers Left Alive was filmed. Image via Airbnb.com. Screenshot from the movie of a stairway scene. The same stairway at 82 Alfred Street as it looks now - post-renovation by its current owner Jeff Cowin. Image via Airbnb.com. With a small crew shooting mostly at night (from dusk to dawn), the production filmed at 82 Alfred Street and around Detroit for about a week. Only Lovers Left Alive treats us to Jarmusch’s “lonely but lovely” visions of Detroit as Adam and Eve (the luminescent Tilda Swinton) go cruising at night, driving by the city’s iconic landmarks such as the deserted Packard Plant and the Michigan Theater (once a gorgeous cultural gathering place, now a car park). 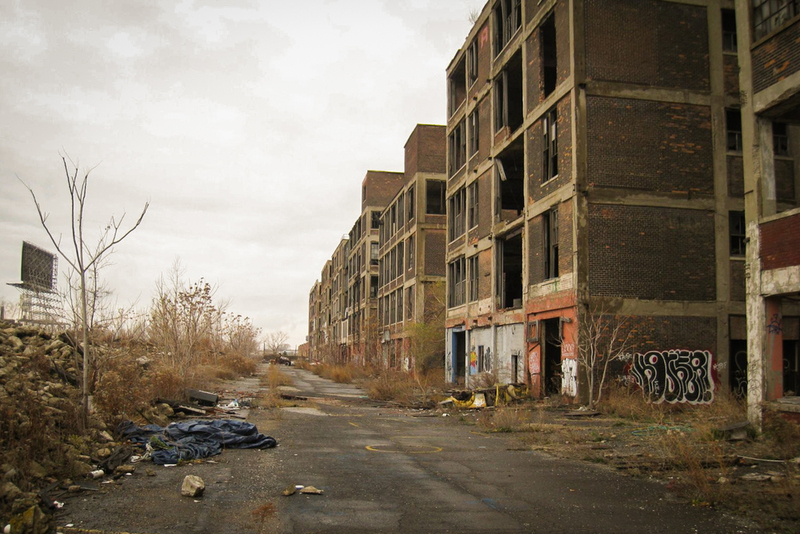 Screenshot from the movie as Adam and Eve drive around the city, passing by Detroit landmarks such as the abandoned Packard Plant. The abandoned Packard Plant in Detroit, Michigan. Image via LocationsHub.com. The director took great care to choose the film locations for Only Lovers Left Alive. "The places are like characters, they're as important to me as characters in the film," said Jarmusch. Originally, Rome and Detroit were supposed to be the settings for Eve's and Adam's world respectively. In the final film, Eve lives in Tangier instead, but Adam's home stays in Detroit. "The places inform you in a lot of ways," said Jarmusch. "Adam lives in Detroit to kind of hide, and his view of Detroit is desolate - nighttime and desolation. But that is not all there is of Detroit - our film doesn't show you the amazing people there, the stuff going on, the interesting activity. But he's not part of that." "(Jarmusch) was truly captivated. He loved the energy and that kind of swagger that the people of Detroit have," said Detroit cinematographer Christos Moisides, second-unit director of photography. "It ... was more the haunting beauty that's so cinematic. It may not be pristine beauty, but there's a lot of amazing history," Moisides said of the director's atmospheric visions of the city. Detroit’s nocturnal landscapes fit Jarmusch's vision. "He wanted to keep it natural and very stark," Brautigan said. — Christos Moisides, Second Unit Director of Photography - on filming in Detroit, Michigan. Screenshot from the movie of a night scene filmed in front of Detroit's Fox Theater. The Fox Theater, another Detroit landmark - image via Google. Screenshot from the movie of Eve's cab as it drives through the empty streets of Detroit. — Jim Jarmusch, Director of Only Lovers Left Alive, on choosing film locations. Screenshot from the movie of Adam and Eve at the Michigan Theater car park. The formerly beautiful Michigan Theater is now a car parking lot in Detroit. Image via Google. In December 2012, a few months after Jarmusch and company wrapped up production, Jeff Cowin bought 82 Alfred Street - lock, stock and barrel. Since then, he has been restoring the mansion back to its glorious former self. In addition to preserving the historic details of the Queen Anne home such as its wood floors, paneling and trims, Cowin also modernizes its kitchen and bathrooms. "It's a labor of love. I work all the time, all my waking hours, but it's my passion," said Cowin. "It's magical when you can walk in the door and you can sense the history." Today, you too can experience a bit of Detroit’s glorious past while sleeping in the house that was the film location of Only Lovers Left Alive. Yes! 82 Alfred Street is now available for rent on Airbnb. I've never been to Detroit, but after having watched Only Lovers Left Alive multiple times (as it is one of my most favorite films this year), I'm putting Motor City and 82 Alfred Street on my bucket list. Like Jarmusch and the late Malik Bandjellou (who directed and filmed the Oscar-winning documentary Searching for Sugarman in Detroit), I feel strangely protective and enamored with the desolate fading beauty of the city. And ... its rich musical heritage. Only Lovers Left Alive celebrates both ... in spades. If you're lucky enough to visit Detroit any time soon and have a chance to stay at 82 Alfred Street, do let us know how it feels to be inside a famous movie house. We'd love to hear from you! The music/reading room at 82 Alfred Street today. The property is now available for rent via Airbnb.com. Image via Airbnb. For information on filming in Michigan, visit the Michigan Film Office.